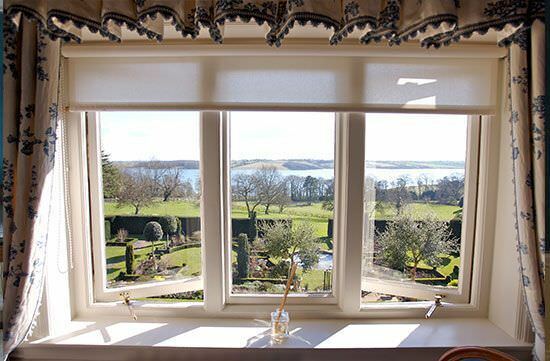 A medium-sized room with a large bay window overlooking the gardens and Rutland Water. 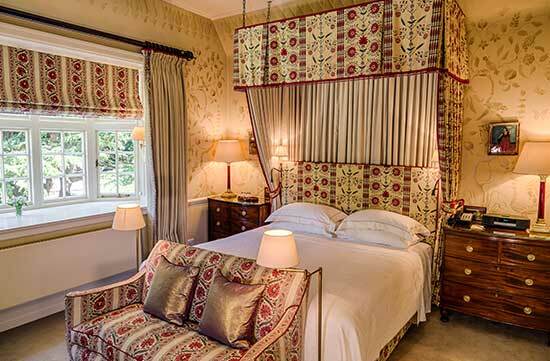 The walls are fabric-lined in caramel coloured linen with matching curtains, having two comfortable chairs, 6′ bed and a breakfast/writing table. 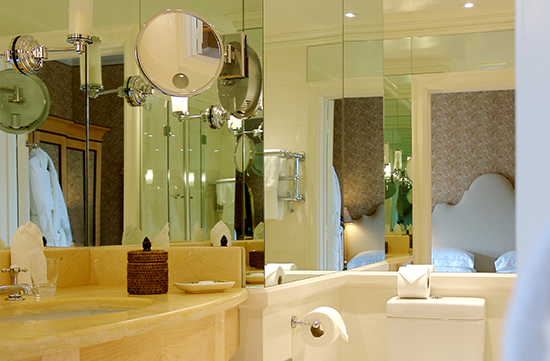 The marble bathroom (7′3″ x 8′0″) has good lighting and most of the walls are mirrored. It has a good fixed shower over the bath as well as a hand shower. 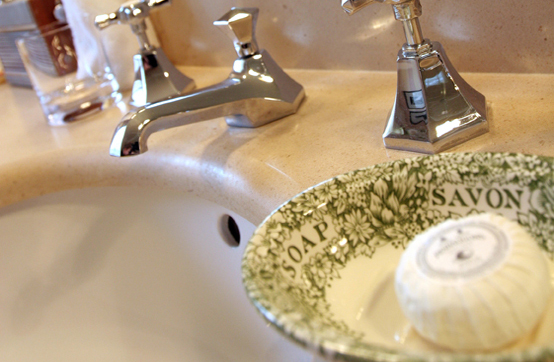 There is one step up into the bathroom. 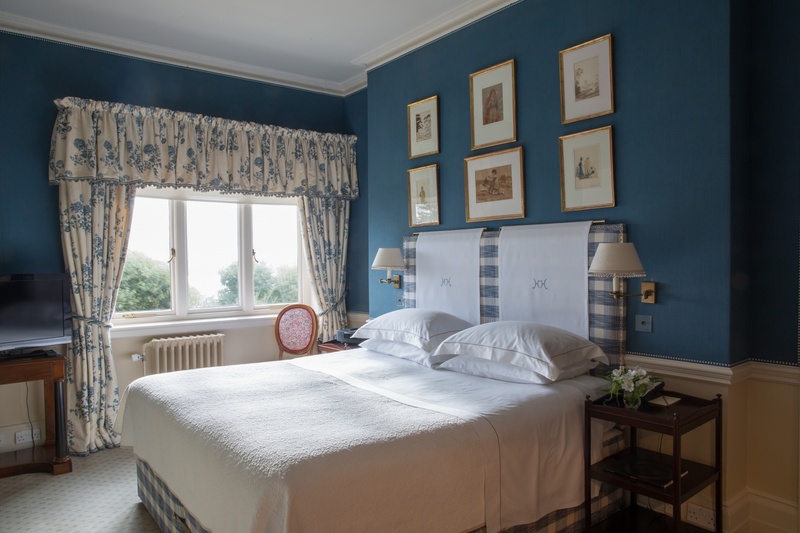 A delightful room with blue decor, king size bed and a freestanding wardrobe. 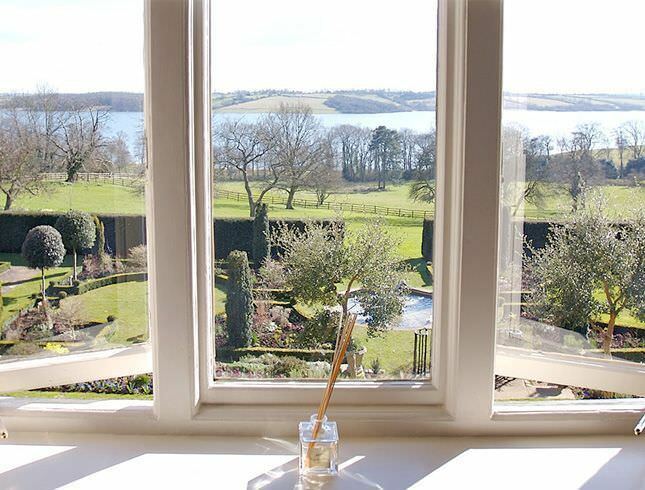 The room has a writing table and beautiful views over the gardens and Rutland Water. The bathroom has a marble floor and deep tub. Excellent mirror and marble vanity unit is in the window of the bathroom (8′0″ x 6′6″) so that you can enjoy the view while cleaning your teeth! There is one step up into the bathroom. 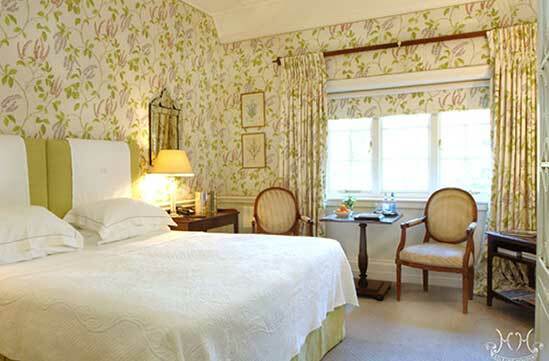 Cherry is a medium sized room decorated in a Senna linen with Sylvana Orchard Blossom Nina Campbell fabric. Rutland Water is visible from Cherry but the room does not face in that direction. The direct view is west towards the Croquet Pavilion and lawn. 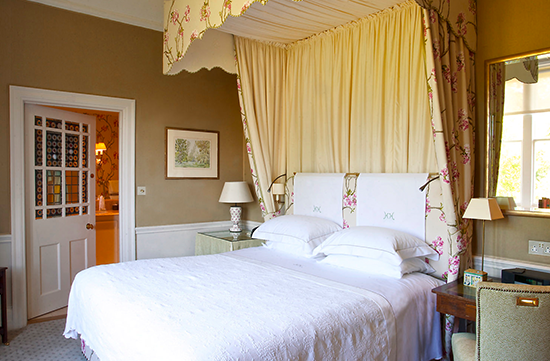 There is a writing table, two easy chairs with breakfast table and a canopy above the large bed. Excellent bathroom (12′0″ x 6′0″) with double basins, bath and stand-up shower. This room has a large bay window that overlooks the gardens and historic cedar trees on the north side of the house. A Persian flavour with 17th Century hand-painted Persian panels and walls stencilled with a Persian ‘Tree of Life’ motif. It has a small sofa with a writing/dressing table set in an American walnut double wardrobe providing ample hanging space. 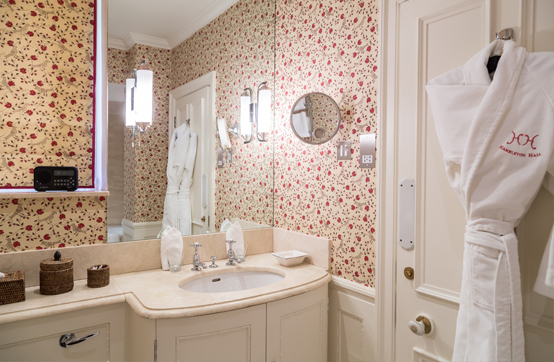 It has a well-appointed marble bathroom (10′0″ x 5′6″) with bath and a good stand up shower. Together with Chota makes an ideal family combination, sharing as they do, a private lobby area. 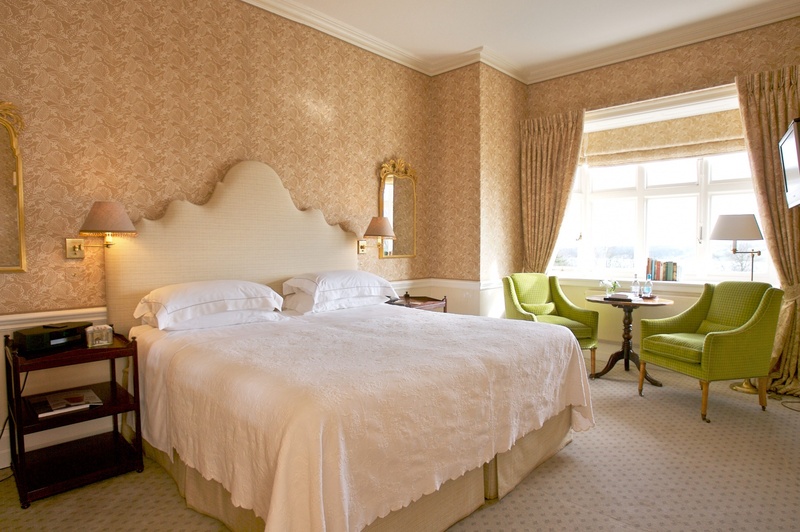 Named after a frequent visitor to Hambleton Hall in the 20s and 30s. This is a charming medium-sized room overlooking the gardens at the front and a fine group of Cedars planted by Walter Marshall in 1881. Decorated in blue and yellow Nina Campbell design fabric that covers the walls and is used for the curtains. A square breakfast table in the window, two Bergeres (chairs with upholstered seat and back) and a large freestanding wardrobe. A spacious medium bathroom (11′6″ x 5′8″) with a large bath, double basins, stand up shower and a window overlooking cedar trees.